Eliminates the need for a mechanical room. The new FMPS-P: FriconUSA Modular Parallel System, Premium series, air cooled condenser, are the result of many years of research to provide practical, fast, high quality, efficient solutions and reliable technology for the commercial refrigeration industry. The most common applications are centralized refrigeration for small and medium-sized supermarkets, cold rooms, blast coolers or freezers, continuous rapid cooling tunnels, block or flake ice making machines, thermal ice storage, etc. Our exclusive “patented pending” Modular Parallel System (MPS) design permits forming a parallel system “Rack” with Variable Refrigerant Flow (VRF) by simply joining units (1 Master and up to 13 Slaves) in order to create “loops” for one or two suction groups for any application. Our MPS system allows different “loops” to form at different evaporation temperatures depending on the application requirements, for example a supermarket typically requires circuits of +35°F, +20°F and +14°C SST for medium temperature display cases and coolers. In a conventional Rack these requirements are combined in a suction group at the lowest temperature adjusting each need with EPR valves. With our MPS you could have three suction groups at three different temperatures, minimizing the size of the compressors and increasing system efficiency. 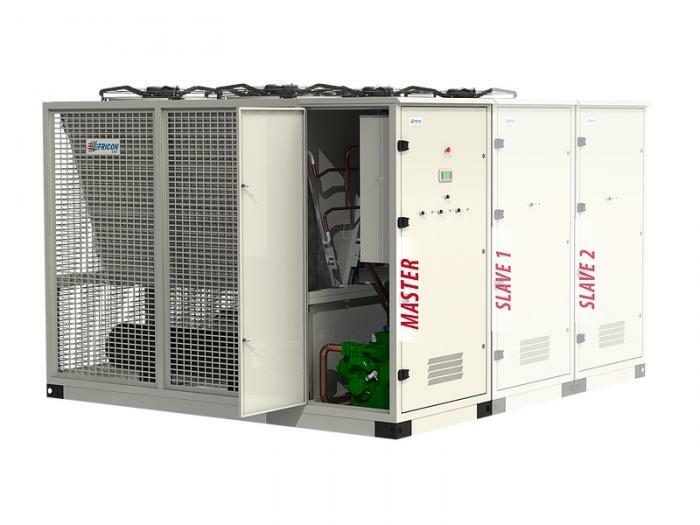 Capable of forming a parallel system (rack) with Variable Refrigerant Flow (VRF) from 2 to 8 compressors with a capacity range from 18 HP to a maximum of 200 HP* to provide a quick, efficient and economical solution to our clients. *Limited by the size of the liquid receiver built into the Master unit. For capacities higher than 200 HP, options for an external liquid receiver are available. Contact the manufacturer. Permits the modular system capacity to expand (on a conventional rack the capacity is fixed). Fewer refrigerants required throughout the system.•Bitzer Ecoline Semi-Hermetic compressor with spring mounted vibration insulation, crankcase heater and internal thermal protection. High efficiency semi-hermetic Bitzer Ecoline compressors with variable capacity control “CRII” between 10% and 100% on the Master unit. Aluminum structure with galvanized steel reinforcement, high efficiency condenser with reinforced structure and aluminum micro-channel coils. Its low weight and size reduces the costs of transportation, installation and construction.•Galvanized, powder coated, acoustically semi-insulated and weatherproof semi-enclosed compressor cabin. EC type condenser fan for the Master Unit, AC type fan for Slave(s). Flexible joint on suction and discharge lines on the compressor. Oil management system installed in Master unit. Electronic Control System; compressor(s) and condenser fans operational management: alarms, measurement of pressure and temperature variables, 132x64 LCD backlit built-in display with 6-button keypad. Alarm management: 3 alarms for compressor(s) (overload, pressure and oil) and 1 overload alarm for condenser fans. Fixed high pressure compressor control.